My two sons absolutely love tomatoes. Whenever I have fresh tomatoes in the house I have to hide them or else they are completely consumed before I have made the meal I purchased them for. Grape and cherry tomatoes are especially susceptible to being eaten, since they can just be popped into my boys mouth and I never know until there are no tomatoes left to cook with. The other vegetable that has been popular in my house this summer, is corn. Corn prices have been low, so I have been using corn as an ingredient in multiple meals a week. 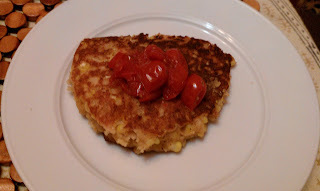 I was pleased when the August issue of Better Homes and Gardens magazine had a recipe for Corn and Bean Fritters with Tomatoes, which combined two of my household's current favorite foods. This recipe has 9 ingredients, including the optional parsley or cilantro topping. The total prep and cook time is approximately 30 minutes. For whatever reason finding cherry tomatoes at my local grocery store is hit or miss, so I used grape tomatoes instead. I used fresh sweet corn, I prefer the taste when it's in season over the frozen variety. Finally, I chose not to use the optional parsley and cilantro topping, since my kids can be finicky about 'green' toppings. I followed the remainder of the recipe as written. These fritter are very high in protein, 14 grams per serving. The taste of the fresh corn was delicious and the fritters turned out great. The one suggestion I have is to make smaller fritters. The size of fritters the magazine suggests, is awkward to flip and parts of the fritter didn't crisp up completely. These problems would easily be changed by making the fritters about half of the size that the recipe states. I appreciated that this recipe re-heats well, and made a perfect breakfast food for my oldest before kindergarten. For the recipe go to Better Homes and Gardens Corn and Bean Fritters with Tomatoes (registration required). I also like tomatoes and corn. I am also a big fan of cabbage and carrots. Good for the health. These fritters look real good! Hi there, I am a new follower from the Relax and Surf Sunday hop! Love your site! wow... what a great end of summer growing season recipe... love it all!